A.J. Pierzynski Rents Space in Ricky Romero's Head ~ The Bucky Channel - The World of Sports from Wisconsin's Perspective. This post is directly in response to the fact that "MLB Tonight" is the best show on television right now, as it's sort of like a mellowed out NFL Red Zone Channel. It's the flagship show of the MLB Network, and they take us around the country showing us live updates of games. One of the games they showed on Tuesday night was between the Toronto Blue Jays and the Chicago White Sox, as Blue Jays pitcher Ricky Romero was chasing a no-hit bid. He was on pace up through seven innings, until A.J. Pierzynski came up to bat in the 8th with one intention, and one intention alone. 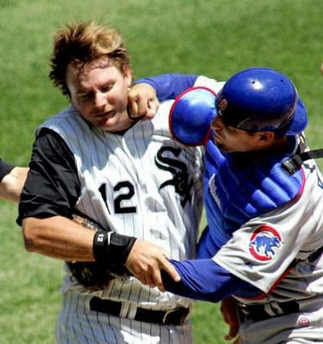 I think at this point Pierzynski was more about getting into Romero's head than he was breaking up the no-hitter. He did just that when a ball skipped in the dirt, and A.J. acted as if it hit his right foot. He was awarded the base, but upon further review the ball was closer to hitting his left than his right, but it didn't come close to him at all. You knew that the no-hitter was over after that, as Romero was now flustered and the next batter was Alex Rios, who hit a two-run home run. There's no doubt that Pierzynski will be laughing in the locker room after this one, whether they win or lose, and I have to say that while it's a tough call, I'm going to decide that I have no problem with what he did. As long as you have outs to play with, you have to do whatever it takes to win the game. Some purists would speak out against A.J. because it's an unwritten rule that you show a little respect against a no-hitter (i.e. not bunting for a single late in the game if you're down a handful of runs), but I say you go for the win, at all costs. A controversial play, and I feel bad for Romero, but I don't fault Pierzynski for what he did.